Ever wonder what an Indian facial is like? NO! NO! Don’t you dare think what I know you’re thinking. This is a video of the Cosmic Barber of Pushkar. Just watching this video makes me feel like I’ve cleansed my dirty, oily face. I can’t tell if the barber is trying to catch spirits or doing a Bollywood dance move. You’ve been warned. Indie filmmakers Andrew McMurry and Nathan McMurry put together this short clip, “Psycho Siri,” as an example of what could happen if you piss off an iPhone. Hit play or go to Link [YouTube] – Thanks Tiffany! Is this the Samsung Galaxy S3? 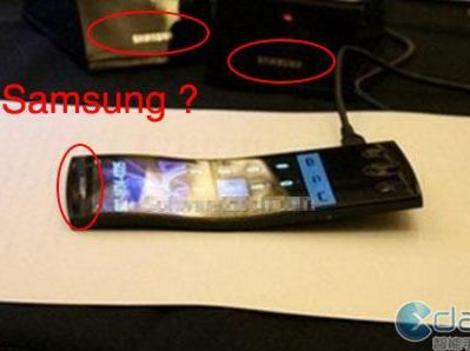 The rumours, leaks and speculation on the Samsung Galaxy S3 are never ending and we've laid eyes on extremely suspicious spy shots from a Chinese website. The latest shots offer up a handset quite different to what has been talked about thus far. It sports a peculiar S-shaped bend in the 4.6-inch 3D screen which looks to be highly un-ergonomic, but hey maybe it's the future. It also suggests the 3D screen will use Super AMOLED Plus technology and have a 1280 x 720 resolution. Our question though, how does 3D work on such a ridiculously curved display? Further inspection shows three large unsightly buttons below the screen with the middle one rocking the icon for "Play Pause" – very odd. There also seems to be a huge gap between the screen ending and the buttons starting which seems like a strange design and adds unnecessary length to the handset. So unless Samsung has completely gone off its rocker, this is very unlikely to be the Galaxy S3. However who doesn't want an S-shaped screen? Is the Earth Getting Lighter? 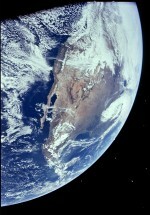 But overall, Dr Smith has calculated that the Earth – including the sea and the atmosphere – is losing mass. He points to a handful of reasons. For instance, the Earth’s core is like a giant nuclear reactor that is gradually losing energy over time, and that loss in energy translates into a loss of mass. But this is a tiny amount – he estimates no more than 16 tonnes a year. And what about launching rockets and satellites into space, like Phobos-Grunt? Dr Smith discounts this as most of it will fall back down to Earth again. But there is something else that is making the planet lose mass. Gases such as hydrogen are so light, they are escaping from the atmosphere. Smith concluded that the Earth loses 50,000 metric tonnes each year. People often cite admirably high-minded reasons for wanting to visit a specific foreign country. An interest in history or architecture, perhaps. A desire to walk in the footsteps of their favourite author or artist. Or maybe they want to make a musical pilgrimage to the spiritual birthplace of jazz. Bully for them, but that's not me. I wanted to visit Japan because of a video game in which you had to jump over animated turds. The game was called Kato-chan & Ken-chan – a cheerful platform game in the vein of Super Mario Land, except the lead characters urinated, farted and defecated throughout each level. Kato-chan & Ken-chan was one of many imported, inexplicable Japanese titles I encountered while working in a games shop in the early 90s. Mario and Sonic made sense to western players, but lurking just beyond these palatable mascots was a world of entertainment too strange to ever secure an official European release: fascinating, crazy games full of talking octopuses and jaunty tunes. American games were fun but bland. Japanese games oozed a demented spirit. Unfathomable, futuristic madness: that's what made me want to visit Japan. Of course, it helps that Japan has, for years, been presented as a kind of Nerd Mecca. Not only is it the undisputed gadget capital of the world, it's a place where being a geek (or otaku) is comfortably mainstream. Former Prime Minister Taro Aso is an enthusiastic manga-collecting otaku, the TV ad breaks heave with glossy commercials for collectible card games, and multi-storey games arcades are commonplace. There's a gadget in every hand. Outside rush hour, the subway is eerily silent: thanks to a strong underground signal, everyone's staring at their smartphones, texting, playing games, or reading. Only after a fortnight did it strike me: not once did I hear a single person actually speaking into their phone on the Tokyo subway. 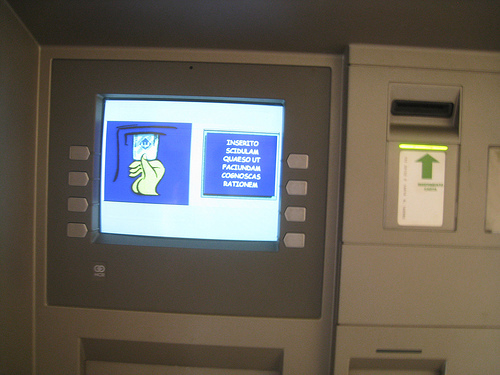 Everyone – and I mean everyone – seemed to be perpetually tapping and swiping in silence. Unnerving to many: to a geek like me, it felt strangely comforting. It's easy to find grand-scale geek spectacle in Tokyo: just hop on the monorail to Odaiba, a man-made island in the middle of Tokyo bay. There, nestled amongst a collection of Bizarro skyscrapers straight out of Starship Troopers, is Miraikan, the National Museum of Emerging Science and Innovation. Here you can watch celebrity robot Asimo go through his paces, or simply gawp in astonishment at the gigantic "geo-cosmos globe": an LCD-clad model of the Earth capable of depicting metrological data in real time. This is what Logan's Run would've looked like if they'd had more money and time. There are also a series of frankly baffling exhibits, including one which, apparently impossibly, projects a gigantic microbe-style creature around your feet as you enter. This virtual floor-dwelling entity then follows you around the room as you shuffle about, interacting with monitors with giant eyes on them, some of which offer to "turn you into a song". It's like a cheese dream on a mothership. For a more down-to-earth nerd-out, Tokyo's Akihabara district is to geeks what San Francisco's Castro Street is to the LGBT community. It's an otaku paradise, an overwhelming whirl of shops selling electronics, games and comics. Any object you can conceive of having a USB attachment poking out of it is for sale, along with several hundred thousand that you can't. One of the few places I did want to spend money was in the arcades. In Britain, arcades have largely died out: we play at home, on Xboxes and PlayStations. Consoles are even more widespread in Japan, of course, but for many, finding the time and space to play in comfort is tricky. Home is often a cramped flat for all the family. Hence the evolving use of manga cafes (or mangakissa) for the nerd seeking a bit of peace and quiet. Originally these were internet cafes where otaku could gather to drink coffee and read comics: they've subsequently morphed into surrogate bedroom services. For an hourly fee you can hire a private cubicle containing a TV, a BluRay player, a computer, a games console, a stereo … everything you'd find in a techno-savvy twentysomething's home den, right down to the bed (increasing numbers of people sleep in these bedrooms-for-hire overnight: they're open 24 hours and are considerably cheaper than a capsule hotel). On the ground floor: endless rows of what the Japanese call "UFO grabbers" – those familiar fairground games in which you make a doomed attempt to grab an underwhelming prize using a mechanised claw. They seem to love these things, despite the fact that to the best of my knowledge no human being has ever successfully extracted a prize from one. Failure booths, I call them. Go up a floor and the crazy video-gaming begins. Given the competition from home consoles, arcade machines have to offer something different. Case in point: Cho Chabudai Gaeshi ("Flipping the Tea Table Game") which consists of an arcade cabinet with a small table attached to it. It's actually more of a stress reliever than a game: the aim is to vent your frustration by hammering furiously on the tabletop before tipping the whole thing over in a rage. Time it properly and you'll cause maximum on-screen chaos. My favourite level was set in an office, with the table doubling as a desk: upend your workstation at just the right moment and you'll send co-workers plummeting out of the window to their deaths. Above that: a floor filled with super-advanced photo booths known as purikura – essentially digital dressing-up boxes. There are two main uses of a purikura: either jostle in with a bunch of friends to commemorate a night out, or, if you're a teenage girl and/or a psychopath, spend hours perfecting your costume before having your image digitally altered until you resemble a creepily infantilised manga cover girl. Top floor: a roomful of sombre youths vying for individual supremacy using some form of networked arcade strategy game that uses collectible cards. Imagine witnessing a game of bridge being played in the Cabinet War Rooms in the year 2072 AD. Some of the games are based around recognisable sports (like football), others around ancient samurai conflicts – but whatever the theme, the nature of the action is absolutely impenetrable to the casual onlooker. The players may as well be communicating psychically. I had no idea what I was looking at: the one thing I did know was that this unfathomable futuristic madness was precisely the sort of thing I'd come to Japan to see. Somehow, I was home. • Virgin Atlantic (0844 2092 770, virginatlantic.com) flies from London Heathrow to Tokyo from £846pp return. Mandarin Oriental Tokyo (00800 28 28 38 38, mandarinoriental.com/tokyo) offers rooms from £357 per night, B&B. Conrad Tokyo (+81 3 6388 8000conradhotels.com) has Bay View Rooms from ¥42,000 (around £350). The Peninsula Tokyo (+81 3 6270 2888, peninsula.com) costs from £374 B&B, excluding taxes, for a superior room. ​Game consoles. They are our life, our love, our best escape until someone finally gets around to inventing the Holodeck. Unfortunately, like anything mass-produced from the same source, they are certain to have a few... glitches (kind of like the Royal Family). Most present in people's minds is the Red Ring of Death, the blinking red indication that your Xbox 360 has up and died. However, almost every single console since time immemorial (i.e., 1977) had had its own glaring problem, which frustrated nerds then just as much as the RRoD does today. Take an aggravating walk down down the Hall of Videogame Console Failures Past, won't you? Does Your Motorcycle Look Too Cool? 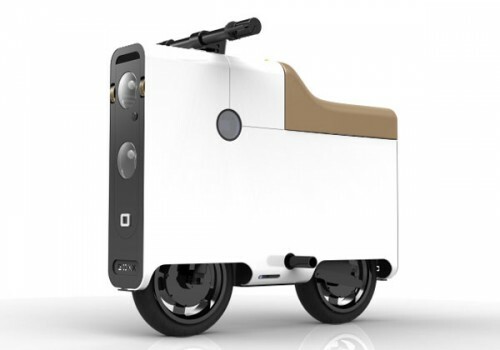 Then Get The Boxx Bike! It may not be a guaranteed in for the biker gang of your choice, but at least you don’t have to put gas in it! The BOXX electric bike is the new square way to get around town without negatively impacting the environment, although people may complain that it’s a bit of an eyesore. It goes up to 35 mph, so you won’t really be hitting the highway on this bad boy, but maybe the light (120 lbs.) and short (36 inches long) body style is what you’re looking for, like when you need to pick it up and run away from that biker gang you tried to join. Baudelaire once said that “the greatest trick the devil ever pulled was convincing the world he doesn’t exist.” But in modern-day Vatican City, the devil is considered alive and well. The former Pope John Paul II personally performed three exorcisms during his reign, and the current Pope Benedict XVI is expanding the ranks of Catholic-sponsored exorcists throughout the world. In fact, Father Gabriele Amorth, the Church’s chief exorcist, claims to expel more than 300 demons a year from the confines of his Vatican office, and there are more than 350 exorcists operating on behalf of the Catholic Church in Italy alone. Amorth also teaches bishops how to tell the difference between satanic possession and psychiatric illness, noting that those who suffer from the former seem to be particularly repulsed by the sight of holy water and the cross. 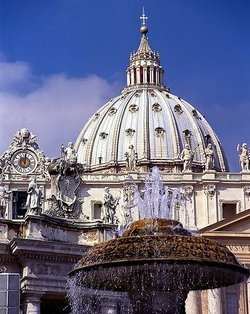 With 1.5 crimes per citizen, Vatican City has the highest crime rate in the world. It’s not that the cardinals are donning masks and repeatedly robbing the bank, it’s just that the massive crowds of tourists make Vatican City a pickpocket’s paradise. The situation is complicated by the fact that the Vatican has no working prison and only one judge. So most criminals are simply marched across the border into Italy, as part of a pact between the two countries. (The Vatican’s legal code is based on Italy’s, with some modifications regarding abortion and divorce.) Crimes that the Vatican sees fit to try itself—mainly shoplifting in its duty-free stores—are usually punished by temporarily revoking the troublemaker’s access to those areas. 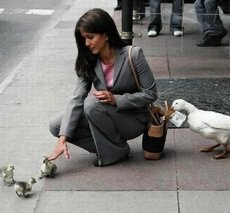 But not every crime involves theft. In 2007, the Vatican issued its first drug conviction after an employee was found with a few ounces of cocaine in his desk. Some sins are simply too much for a local bishop to forgive. While priests can absolve a sin as serious as murder (according to the Church), there are five specific sins that require absolution from the Apostolic Penitentiary. This secretive tribunal has met off and on for the past 830 years, but in January of 2009, for the first time ever, its members held a press conference to discuss their work. 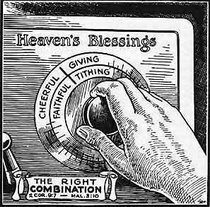 Three of the five sins they contemplate can only be committed by the clergy. 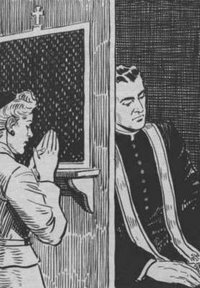 If you’re a priest who breaks the seal of confession, a priest who offers confession to his own sexual partners, or a man who has directly participated in an abortion and wants to become a priest, then your case must go before the tribunal to receive absolution. The other two sins can be committed by anyone. The first, desecrating the Eucharist, is particularly bad because Catholics believe that the bread and wine transubstantiate into the body and blood of Christ. Messing with them is like messing with Jesus. And then, there’s the sin of attempting to assassinate the Pope. That one’s pretty self-explanatory. The meetings of the Apostolic Penitentiary are kept confidential because they’re a different form of confession. The sinner is referred to by a pseudonym, and only the Major Penitentiary, Cardinal James Francis Stafford, decides how the sin shall be dealt with. Presumably, a bunch of Hail Marys doesn’t cut it. 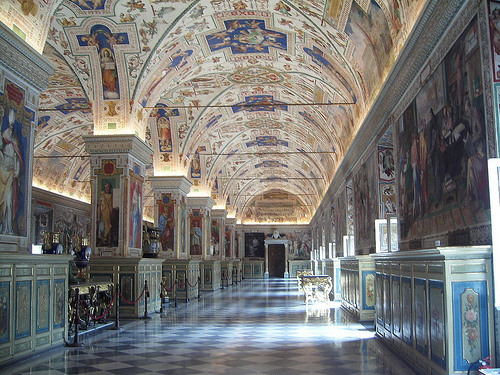 The Vatican’s secret archives haven’t been truly secret since Pope Leo XIII first allowed scholars to visit in 1881. Today, it’s even more accessible. Outsiders are free to examine the correspondences of every pope for the past 1,000 years, although there is one catch: Guests have to know exactly what they’re looking for. With 52 miles of shelves in the archives, the librarians prohibit browsing. The most famous letter there is probably Henry VIII’s request that his marriage to Catherine of Aragon be annulled, which Pope Clement VII denied. Henry divorced Catherine anyway and married Anne Boleyn (and four other women), leading to Rome’s break with the Church of England. The archives also contain an abundance of red ribbons, which were used to bind 85 petitions from English clergyman and aristocrats. Pope Benedict XVI routinely sends text messages of his homilies to mobile subscribers around the world, and in 2009, the Vatican opened up an official YouTube channel to show various Papal addresses and ceremonies. The Vatican even released an iPhone application that contains multilingual versions of the Breviary prayer book and the prayers of daily mass. But the Pope’s enthusiasm for technology isn’t limited to cell phones and the Internet. The Vatican has also added solar panels to the roof of the Pope Paul VI auditorium as part of its commitment to fight climate change. Nowadays, the Swiss have a reputation for pacifism, but back in the 1500s, they were considered an unstoppable military force. Swiss armies were renowned for the their mastery of a weapon called the halberd, a deadly combination of a spear and an axe, and their ground troops were famous for routinely demolishing legions of enemies on horseback. After Pope Julius II witnessed their ferocity in battle 500 years ago, he recruited a few soldiers to become his personal bodyguards. 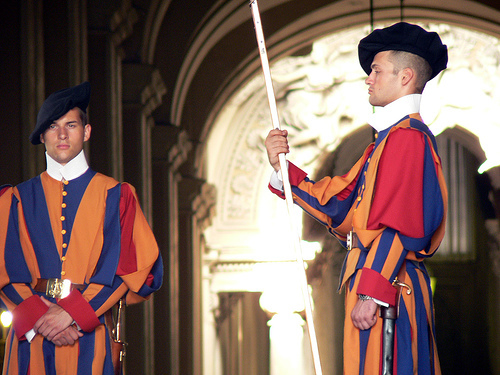 Ever since, Swiss Guards have pledged fidelity to the Pope, sometimes dying for the cause. During the sacking of Rome in 1527, for instance, three quarters of them were killed while providing cover for Pope Clement VII to escape. Today, the hundred or so members of the Swiss Guard spend most of their time bedecked in Renaissance garb, twirling their halberds in ceremonies or manning checkpoints around the Vatican. When the Guards are actually protecting the Pope, they wear plain clothes and carry distinctly modern weapons. 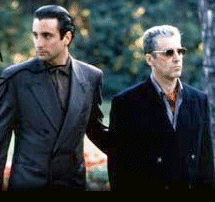 In The Godfather: Part III, a shady deal between the mafia and the Vatican leads to the murder of the Pope. Was this based on a true story? Possibly. On the morning of September 29, 1978, Pope John Paul I was found dead, sitting up in his bed, after only 33 days in office. Although Vatican officials claimed the 65-year-old pope died of a heart attack, there was never an autopsy, and at the time, the Vatican definitely had ties to organized crime. Sure enough, in 1982, Vatican Bank president Father Paul Marcinkus resigned from his post after a series of scandals exposed the bank’s ties to the mafia. Eventually, the bank had to repay more than $200 million to its creditors. But Marcinkus was never indicted of a crime. And though he was suspected of being involved in several mysterious deaths, including Pope John Paul I’s, Marcinkus successfully claimed diplomatic immunity in the United States and retired to Arizona in 1990. Once a cardinal becomes the Pope, he’s the designated leader of the Catholic Church and God’s representative on Earth for the rest of his life. As with Supreme Court justices, he can resign before his death, but that’s unlikely. (It’s been more than 500 years since the last papal resignation.) Further, as modern medicine improves, even seriously ill people tend to stick around longer, meaning that a Pope could be alive but unable to perform his duties for years, as was the case with John Paul II. What happens then? Well, no one is really sure. A cardinal can take over the Pope’s responsibilities as the Vatican’s head of state, but no one else is allowed to carry out his ceremonial duties. In the end, many masses and benedictions simply go unperformed until the Pope either passes away or recovers. But that’s not always enough. By the end of 2007, the city-state was $13.5 million in the hole. Part of the problem was the weakened American dollar, which translated into less purchasing power. Another contributing factor was the lackluster performance of the Vatican’s newspaper, L’Osservatore Romano. To boost subscriptions, the Pope has asked the editor to spice up the layout with more photos and allowed him to cover world news stories in addition to the traditional religious fare. The above article was written by David Goldenberg. 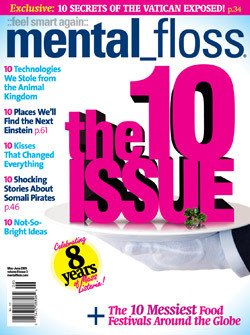 It is reprinted with permission from the May/June 2009 issue of mental_floss magazine. The PC Weenies. Tech Webcomics for Geeks, and the People Who Tolerate 'Em. Glitchtown: Updates Mondays and Fridays. Or so they say. You will come back won't you?